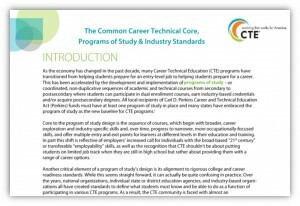 Yesterday, NASDCTEc released a new paper -Â The Common Career Technical Core, Programs of Study & Industry-Based Standards – during a webinar. Leveraging the methodology used to compareÂ over 45 states’ CTE standards to the Common Career Technical Core (CCTC) last year for The State of Career Technical Education: An Analysis of State CTE Standards, this new paper examines how a set of 18 industry-based standards match up to the CCTC, with deep implications for state and localÂ development of standards-based programs of study. For one, the industry-based standards, on average, were not particularly well aligned with the CCTC. However, this was largely as expected based on scopeÂ andÂ design of the CCTC compared to mostÂ industry-based standards. The CCTC are benchmark standards that identify what a student should know and be able to do after completing a program of study. As “benchmark standards,” the CCTC are intentionally broad; as “end of program of study standards,” the CCTC cover the full range of knowledge and skills to be imparted over a sequence of courses, from the broadest career exploration to the more occupationally-specific skills. Alternatively, most industry-based standards focus squarely on those occupationally-specific skills, leading to a disconnect between them and the CCTC. We also found that the majority of industry-based standards did not,Â on average,Â address the 12 Career Ready Practices, which are the cross-cutting skills and dispositions necessary for any individual in the workplace. Perhaps the most surprising finding was that less than half of the industry-based standards fully aligned to such PracticesÂ as “communicate clearly, effectively and with reason” and “work productively in teams while using cultural/global competence,” which are so highly demanded in today’s economy. However, the analysis showed that many of the industry-based standards reviewed did align well with theÂ Career Pathway-level standards, which are the most specific standards within the CCTC. Additionally, industry-based standards developed by consortia, such as the National Council for Agriculture Education and the Manufacturing Skill Standards Council, were much Â more likely to address both the Career Cluster and Career Pathway-level standards. Provide guidance to local leaders and educators on how to implement the various sets of state and industry-based standards available andÂ build out a coherent sequence of courses and learning experiences aligned to those different standards. Read the full report here, watch the webinar recording or download the webinar PPT. This blog series provides readers with insight on the valuable content that is being shared at the Career Clusters Â® Institute. Guest bloggers are among teachers, faculty, researchers and other experts that will present at the national gathering in Fort Worth, TX in June. Todayâ€™s guest blogger is Kate Blosveren, Associate Executive Director, National Association of State Directors of Career Technical Education ConsortiumÂ (NASDCTEc), Silver Spring, MD. With the Common Core State Standards being implemented by nearly every state in the nation and the (common) Next Generation Science Standards recently released, there is increasingly broad understanding of the value in having consistent standards used across states to allow for the sharing of materials, best practices and even economies of scale. The Career Technical Education (CTE) community has long valued cross-state models of CTE expectations, largely driven by the National Career ClustersÂ® Framework and national industry-developed standards and assessments. Looking ahead, CTE is poised to enter its next stage of consistent expectations with the introduction of the Common Career Technical Core (CCTC). The CCTC are a set of end-of-program of study standards, developed for states by states, to anchor CTE teaching and learning across the country at both the secondary and postsecondary level. The 2013 Career ClustersÂ® Institute will offer a number of opportunities for participants to learn more about the development of the CCTC, their design, and what comes next, including state adoption and local implementation. Iâ€™m looking forward to seeing you all in Texas next week! Kateâ€™s session, Introduction to the Common Career Technical Core is Tuesday, June 11 from 11:15 a.m.-12:15 p.m. and repeated 1:30 p.m.-2:30 p.m.; she also has a session called â€œOffice Hoursâ€ meant to answer your questions about the Common Career Technical Core-a follow up to the earlier two sessions. This week, the National Association of State Directors of Career Technical Education Consortium (NASDCTEc) launched an alignment study to compare the Common Career Technical Core (CCTC) against state Career Technical Education (CTE) standards. The goal of the study is to assist states and territories in their effort to improve the quality of CTE programs. NASDCTEc is partnering with Global Skills Exchange (GSX) and The Center on Education and Training for Employment (CETE) at The Ohio State University (OSU) to conduct the alignment study. The CCTC is a state-led initiative to establish a set of rigorous, high-quality standards for CTE that states can adopt voluntarily. The CCTC, released in June 2012, was informed by state and industry standards and developed by a diverse group of teachers, business and industry experts, administrators and researchers. The CCTC includes a set of standards for each of the 16 Career Clustersâ„¢ and supporting career pathways that encompass a comprehensive collection of industry-validated expectations of what students should know and be able to do after completing instruction in a program of study. The CCTC also includes an overarching set of Career Ready Practices that apply to all 16 Career Clustersâ„¢. The Career Ready Practices include 12 statements that address the knowledge, skills and dispositions that are important to becoming career ready. NASDCTEc plans to publicly release the results of the alignment study in October 2013 during the fall membership meeting. GSX was founded in 2003 to create a link between the world of work and the world of learning. Within education, GSX provides comprehensive solutions for educationalÂ institutionsÂ that strengthen the preparation of all students to meet the skills demand in theÂ marketÂ economy. In collaboration with partnersÂ fromÂ industry and government, GSX develops solutions toÂ drive the achievement of various student performance goalsÂ includingÂ college entry and completion, industry-based certification, gainful employment and career advancement. Using the context of regional labor market projections,Â GSXÂ creates programmatic relevance for local K-16 education systemsÂ that prepares students to master skills in real time and for future demand.Â To learn more about GSX, visit <http://www.gskillsxchange.com>. OSU CETE is one of the United Statesâ€™ leading institutions for workforce and career technical education and training. Established in 1965, CETE is a full-service organization whose mission is to facilitate workforce improvement by providing leadership, curriculum, information, professional development, program evaluation, and learner assessment products and services for public and private clients throughout the world. To learn more about OSU CETE, visit <http://www.cete.org>. Career Technical Education (CTE) State Directors unveiled the Common Career Technical Core (CCTC), a shared set of high-quality CTE standards. The CCTC is a state-led initiative to ensure that CTE programs are consistent and high-quality across our nation. â€œCareer Technical Education State Directors have put to action their vision for all CTE programs to meet consistent and rigorous standards by coordinating the development of the Common Career Technical Core,â€ said Dr. Patrick Ainsworth, President of the National Association of State Directors of Career Technical Education Consortium and CTE State Director. States may voluntarily adopt the CCTC, which will complement and support other comprehensive college and career ready standards, such as the Common Core State Standards (CCSS) in English Language Arts and mathematics. Over the course of the next year, NASDCTEc will launch an initiative to coordinate a comprehensive gap analysis to compare each state’s current course-level standards against the CCTC program-level standards to determine alignment.Â The gap analysis will be conducted by a team of third-party experts to ensure quality and consistency across the states. Students deserve access to CTE programs that educate and train to high standards and industry demands, and now is the time to support the adoption of a next set of CTE standards that will allow for more opportunities for students and our nation, said Dean Folkers NASDCTEc/NCTEF Deputy Executive Director in a recent editorial featured in Education Week (available only to Education Week subscribers). The editorial is featured in Education Weekâ€™s June 13, 2012 print edition. â€œI agree with U.S. Secretary of Education Arne Duncan, who said that the largest federal career and technical education, or CTE, program “must beÂ transformedÂ if it is to live up to its potential,â€ he said. Forty-two states, the District of Columbia, and Palau supported the development of the CCTC, which will help to answer our need for consistent, rigorous standards that are essential to preparing students for college and careers, he noted.